Caffeine is a naturally occurring stimulant found in the leaves, seeds, or fruit of over sixty plants around the world. Caffeine exists in the coffee bean in Arabia, the tea leaf in China, the kola nut in West Africa, and the cocoa bean in Mexico. Because of its use throughout all societies, caffeine is the most widely used psychoactive substance in the world. The most common caffeine sources in North America and Europe are coffee and tea. Since about 1980, extensive research has been conducted on how caffeine affects health. Most experts agree that moderate use of caffeine (300 milligrams, or about three cups of coffee, per day) is not likely to cause health problems. Caffeine is best known for its stimulant, or "wake-up," effect. Once a person consumes caffeine, it is readily absorbed by the body and carried around in the bloodstream, where its level peaks about one hour after consumption. Caffeine mildly stimulates the nervous and cardiovascular systems. It affects the brain and results in elevated mood, decreased fatigue , and increased attentiveness, so a person can think more clearly and work harder. It also increases the heart rate, blood flow, respiratory rate, and metabolic rate for several hours. When taken before bedtime, caffeine can interfere with getting to sleep or staying asleep. Exactly how caffeine will affect an individual, and for how long, depends on many factors, including the amount of caffeine ingested, whether one is male or female, one's height and weight, one's age, and whether one is pregnant or smokes. Caffeine is converted by the liver into substances that are excreted in the urine. Some people are more sensitive to the effects of caffeine than others. With frequent use, tolerance to many of the effects of caffeine will develop. At doses of 600 milligrams (about six cups of coffee) or more daily, caffeine can cause nervousness, sweating, tenseness, upset stomach, anxiety , and insomnia. It can also prevent clear thinking and increase the side effects of certain medications. This level of caffeine intake represents a significant health risk. Caffeine can be mildly addictive. Even when moderate amounts of caffeine are withdrawn for 18 to 24 hours, one may feel symptoms such as headache, fatigue, irritability, depression , and poor concentration. The symptoms peak within 24 to 48 hours and progressively decrease over the course of a week. To minimize withdrawal symptoms, experts recommend reducing caffeine intake gradually. CAFFEINE IN FOODS AND BEVERAGES. SOURCE : U.S. Department of Agriculture National Nutrient Database for Standard Reference, Release 16 July 2003. Due to its stimulant properties, caffeine is used around the world in any of its many forms, such as coffee, tea, soft drinks, and chocolate. 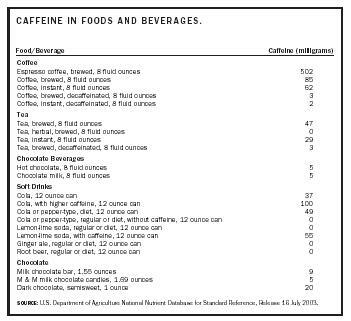 The accompanying table displays the amount of caffeine in foods. An eight-ounce cup of drip-brewed coffee has about 85 milligrams of caffeine, whereas the same amount of brewed tea contains about 47 milligrams. Twelve-ounce cans of soft drinks (soda) provide about 35 to 45 milligrams of caffeine. The caffeine content of coffee and tea depends on the variety of the coffee bean or tea leaf, the particle size, the brewing method, and the length of brewing or steeping time. Brewed coffee has more caffeine than instant coffee, and espresso has more caffeine than brewed coffee. Espresso is made by forcing hot pressurized water through finely ground, dark-roast beans. Because it is brewed with less water, it contains more caffeine than regular coffee per fluid ounce. In soft drinks, caffeine is both a natural and an added ingredient. About 5 percent of the caffeine in colas and pepper-flavored soft drinks is obtained naturally from cola nuts; the remaining 95 percent is added. Caffeine-free drinks contain virtually no caffeine and make up a small part of the soft-drink market. Numerous prescription and nonprescription drugs also contain caffeine. Caffeine increases the ability of aspirin and other painkillers to do their job, and it is often used in headache and pain-relief remedies as well as in cold products and alertness or stay-awake tablets. When caffeine is an ingredient, it must be listed on the product label. Though it has mildly addictive properties, caffeine taken in moderation is not considered to be a health risk, and may improve athletic performance. Current research on how caffeine affects a variety of health issues is summarized below. Keep in mind that most experts agree that moderate use of caffeine is not likely to cause any health problems. Studies have looked at the effects of caffeine on heart health. Moderate caffeine consumption does not appear to adversely affect cardiovascular health. Caffeine appears to increase the excretion of calcium , a mineral needed for healthy bones. Calcium is particularly important to prevent osteoporosis , a bone disease characterized by loss of bone strength and seen especially in older women (although men get it too). Moderate caffeine intake does not seem to cause a problem with calcium, as long as one is consuming the recommended amount (adult men and women should be taking between 1,000 and 1,200 milligrams of calcium, depending on age and gender). 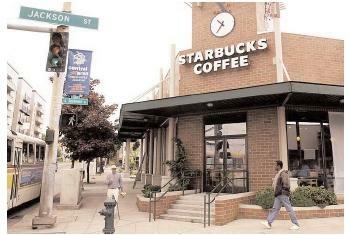 In the past there have been concerns that the caffeine in coffee may cause cancer . Research has shown that caffeine in coffee does not cause breast or intestinal cancer. However, not enough research has been done to determine if caffeine in coffee is involved in urinary bladder or pancreatic cancer. Taken in moderation, it is unlikely that caffeine will cause cancer. Evidence suggests that, at levels over 500 milligrams per day, caffeine may delay conception. Moderate caffeine consumption does not appear to be of concern to women trying to get pregnant. Moderate consumption is also important for a healthy pregnancy. Excessive caffeine intake has been associated with miscarriages and low birth weight babies. Because children have developing nervous systems, it is important to moderate their caffeine consumption. For children, major sources of caffeine include soft drinks and chocolate. Caffeine may be useful as part of a weight control program because it increases the rate at which the body burns calories for three or more hours after being consumed. Caffeine's ability to improve physical performance is well known among well-trained athletes. Through a mechanism that is not completely understood, caffeine seems to increase endurance and speed in some situations. Excessive use of caffeine is restricted in international competitions. Heaney, R. P. (2002). "Effects of Caffeine on Bone and the Calcium Economy." Food and Chemical Toxicology 40:1263–1270. Juhn, M. S. (2002). "Ergogenic Aids in Aerobic Activity." Current Sports Medicine Reports 1:233–238. Kaiser, Lucia Lynn, and Allen, Lindsay. (2002). "Position of the American Dietetic Association: Nutrition and Lifestyle for a Healthy Pregnancy Outcome." Journal of the American Dietetic Association 102:1479–1490. Nawrot, P.; Jordan, S.; Eastwood, J.; Rotstein, J.; Hugenholtz, A.; and Feeley, M. (2003). "Effects of Caffeine on Human Health." Food Additives and Contaminants 20:1–30. Sizer, Frances, and Whitney, Eleanor. (2003). Nutrition: Concepts and Controversies. Belmont, CA: Wadsworth/Thomson Learning. Smith, A. (2002). "Effects of Caffeine on Human Behavior." Food and Chemical Toxicology 40:1243–1255. Weinberg, Bennett Alan, and Bealer, Bonnie K. (2002). The World of Caffeine: The Science and Culture of the World's Most Popular Drug. London: Taylor & Francis. Does excessive caffeine can cause infertility to a woman?